Recent change of name to reflect new book published 2019. Videos below summarize the Tubby Theory. Learn about Tubby Factor, CAC and CIMT to prevent cardiac events. Sustained release berberine has an incredible number of uses because it controls carbohydrate and fat metabolism. It help in weight loss. It prevents cardiac and liver damage and damage to the kidneys. It is incredibly useful for the treatment of type 2 diabetes because it helps control blood sugar (glucose). I and a few of my friends have really been amazed at its all-around effects. It has been shown to help with drug resistance in cancer and higher doses actually kill cancer cells. Biochemically these statements seem impossible but it has central control of metabolism –AMP kinase stimulation. It has now been shown to prevent vision degeneration-so called wet AMD. Most of the what this herbal product does is to control oxidative and nitrosative stresses which control most chronic diseases. By using the other sustained released products that you and your company make –the death rate from chronic diseases will take a massive plunge. This will be a revolution in the prevention of diseases –instead of the treatment of diseases that wind up causing the demise of humans. I’m not sure if you received my recent message so I will resend it. I’m not sure APO-E assay is linked to Alzheimer’s disease. The literature is not clear. Besides you have to do a spinal tap which causes problems. I tried to get Ter interested in making sustained release berberine HCl. This is a fantastic supplement –because it controls blood glucose in type 2 diabetes and probably type 1 as well. It prevents heart damage by inhibiting cardiac fibrosis. It prevents damage to the eye by stimulating eye receptors. It has been found to inhibit drug resistance in cancer. It has no side effects. it creates weight loss by decreasing hunger. Ter said it is very yellow and would contaminate the work area. But, if you could isolate one press with a plastic hood—I would think it could be well controlled. It is quite inexpensive and the sustained release form would sell very well. 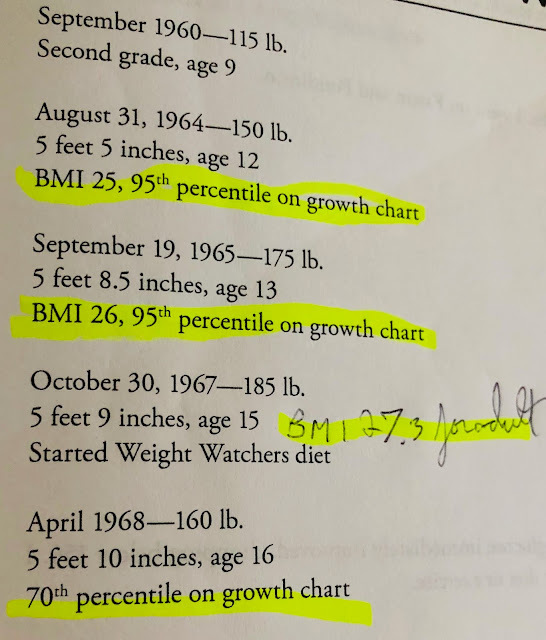 I used an adult BMI chart. The other six books are nonsense. It sells the false hope of Alzheimer’s. My book is more optimistic in the short run. Don't waste your time looking for a cure. Use your last years to have fun. 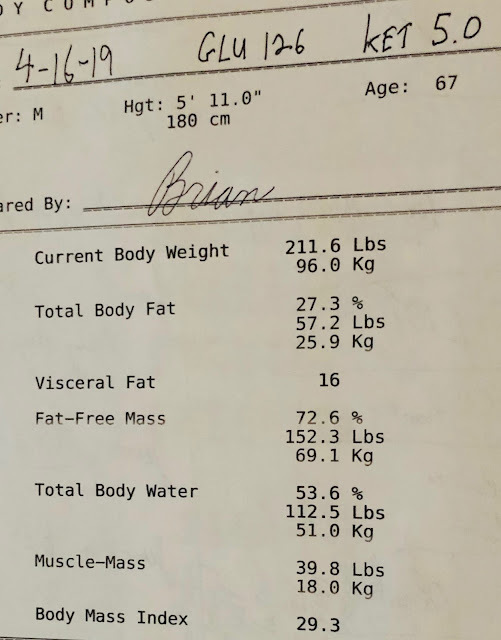 16 months after my Dx was made I am optimistic. My wife and I made two more vacation plans for 2020. I truly believe I will finish year two of my series. I am already writing about the fifth month of the second year. When I first had the Dx confirmed in Dec 2017, I looked up the data on Aricept. If you survive 5 years after a diagnosis of cancer you are considered a survivor. This is why I suggest people don't read book about the end stage of the disease. 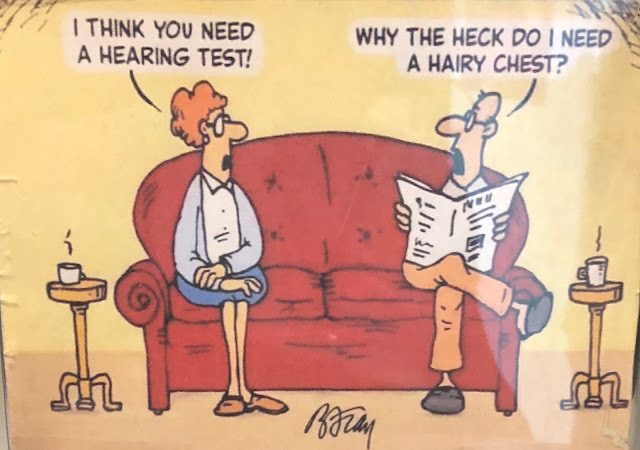 Instead get a hearing test. 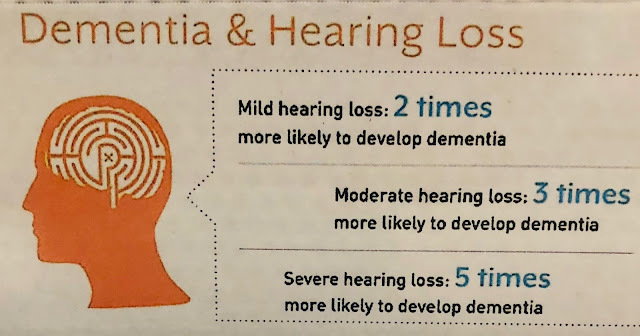 If you have hearing loss do an aggressive testing for dementia to catch it early. I went to an Obesity conference in Houston, the first weekend of April, 2019. I came back and my weight went up to 217. 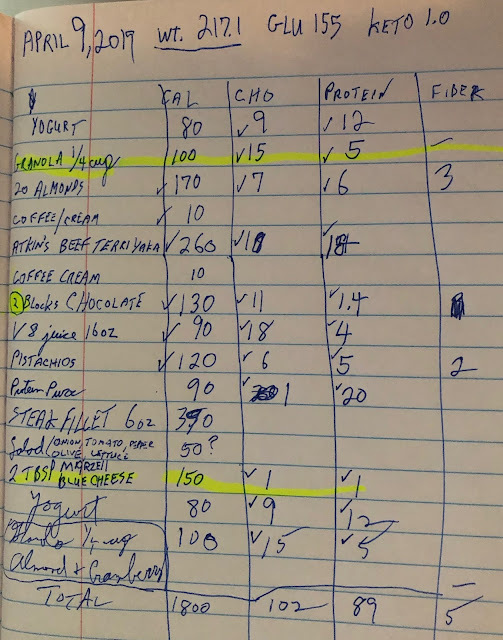 When I want to get back down I have this restrictive diet but no hunger. 1800 calories. 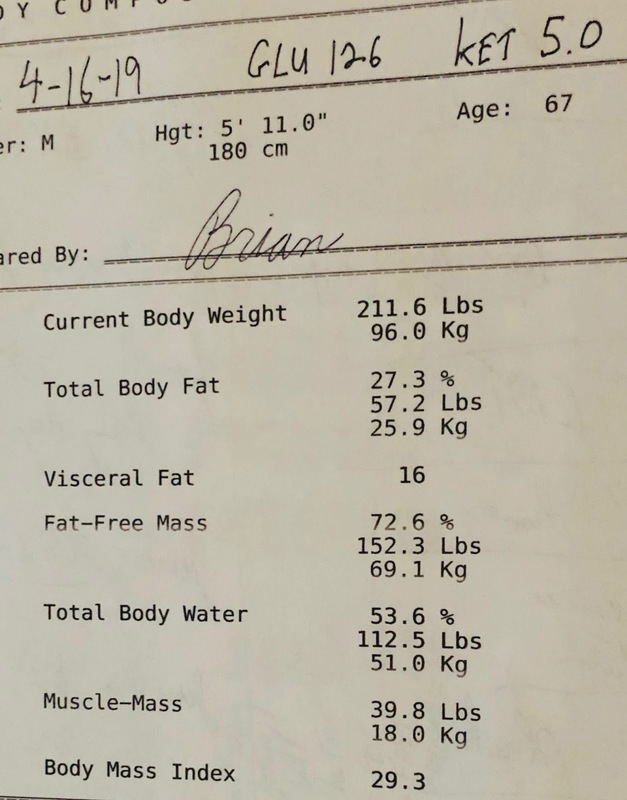 I am 215 pounds and the BIA scale says my basal metabolic rate is 1765 calories. This calculation does not take into account that I am REDUCED OBESE with a reduced resting metabolic rate. I feel cold all the time. I am on Invokana so I lose 200 calories of glucose each day in urine. 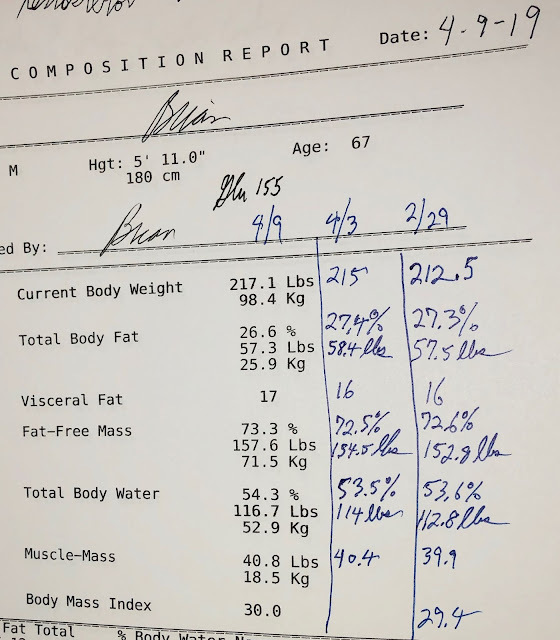 Problem is this calculation does not take into account that I am a REDUCED OBESE with possibly 38% reduction in exercise metabolism. 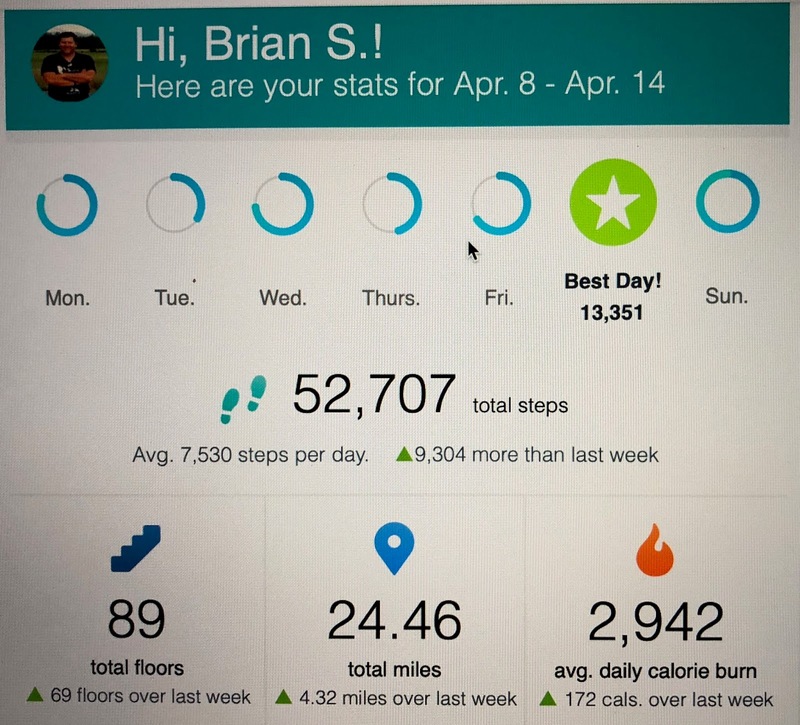 I try to walk 5,600 steps (3 miles) a day. For a lean person they burn 300 calories with walking. For me I burn only 186 calories a day. I try to walk at least 5,000 steps a day to not be classified as sedentary. 10,000 is a good goal but difficult to reach each day. That would be I hour of walking for me. Evidence shows that Alzheimer's patients need to exercise 150 minutes a week. I walk 140 minutes a day but I go up and down the stairs quite a bit. The Fitbit says my average calorie burn is 2,942. For the reduced obese this is not true, as we have reduced exercise metabolism. My BIA scale says for moderate exercise I burn 2654 calories. For light exercise I burn 2471 calories. Let's use the lowest number 2471. Then lets add the 200 calories I lose from Invokana. Thus I can eat 2,671 calories a day and maintain my weight. On the Bon Vivant diet I often eat at least 2500 calories. 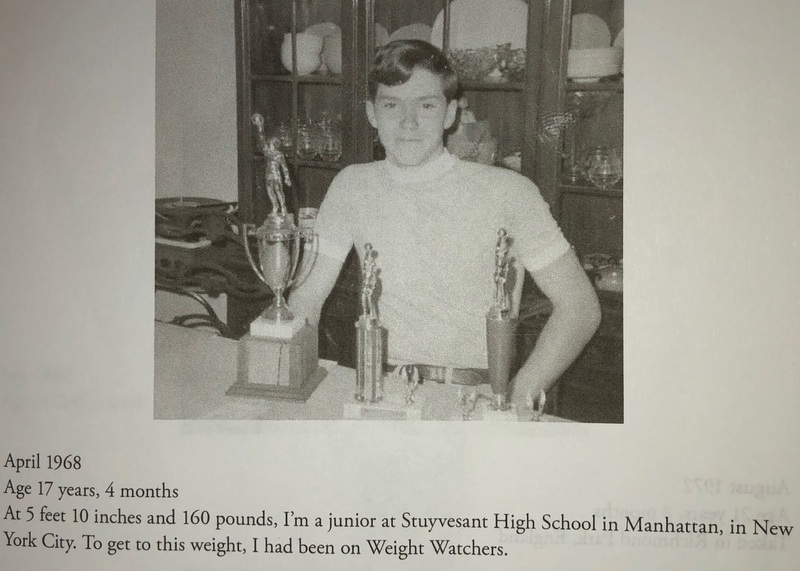 On lower calories I have been down to 200 lbs. That is where I want to be but I easily pop back up to 210 pounds. As Dr. Mike Rosenbaum said at the OMA conference. 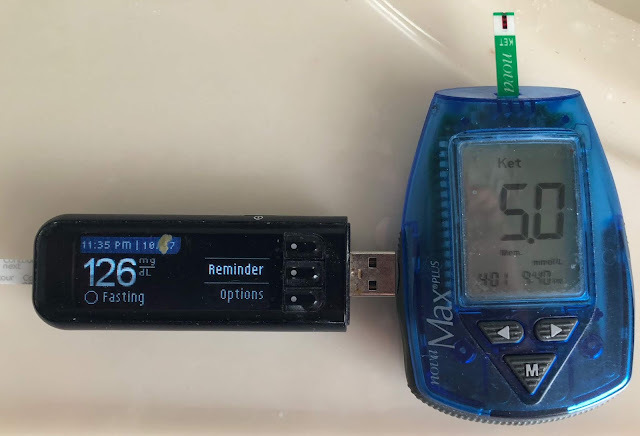 There is a great deal of evidence that the set point plateau goes up and the body always tries to get back there with weight regain due to low leptin. NO EVIDENCE that the set point can be lowered again. Even at 215 pounds my body continues to get me back to 280 pounds with low metabolism and hunger. I believe I handle my hunger with Belviq, Victoza, Metformin, and Caffeine. Nothing I can do to speed up my resting or exercise metabolism. Slide from Houston OMA meeting 2019 and Dr. Mike Rosenbaum. Please compare water pounds and total lean pounds with the changes in weight changes. More false hope claims not substantiated. This is why I write in my book to not chase these nostrums but to have a drink and socialize. Have fun. 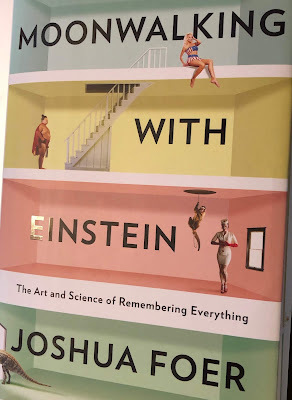 I memorized 15 items in my Memory Palace. 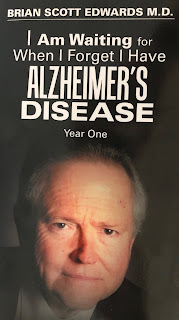 I was diagnosed with Alzheimer's in December 2017, 16 months ago. I was delighted to find that I could remember 15 items via my Memory Palace. Last year on my last memory test I forgot the fourth item on a list of four things they asked me to remember. I tried to use color association back then and it failed. Stress of the test? In the book they suggest you make 12 memory palaces. I would like to remember two songs. I have memorized it before and I sang it to my wife on cruises. But I forget and I have to refresh. I would really like to have it at any time. My Dad was in the Air Force for 20 years. In my childhood grew up on Air Force bases. I was very proud of my Dad being a Captain. I knew a few verses of the Air Force Anthem. I suspect each song will take an hour to put into two memory palaces. I have a very different view of Alzheimer's. Get diagnosed early so can enjoy the years left to you. The gloom and doom is late stage disease. 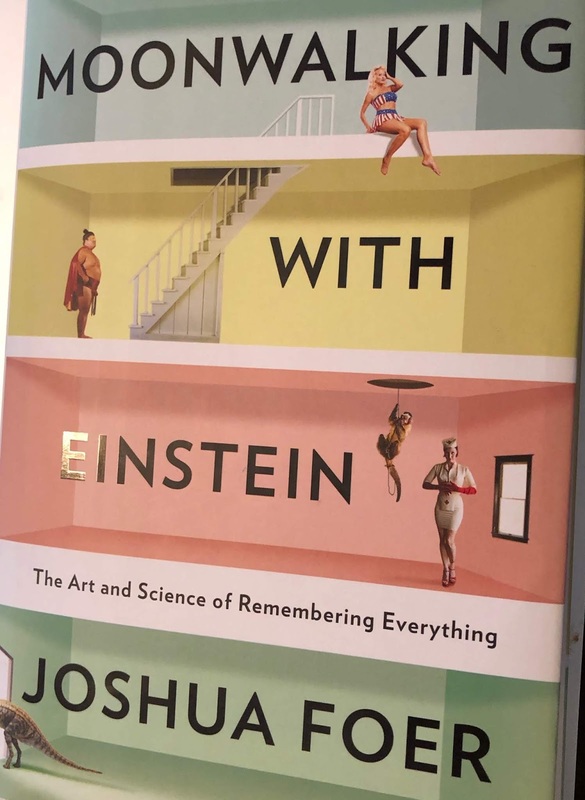 This is a different type of book on Alzheimer’s. There are no claims on how to prevent this dementia. There are no claims on how to cure Alzheimer’s. In a cancer diagnosis, the patient can fight and win. In Alzheimer’s, no one has fought and won. 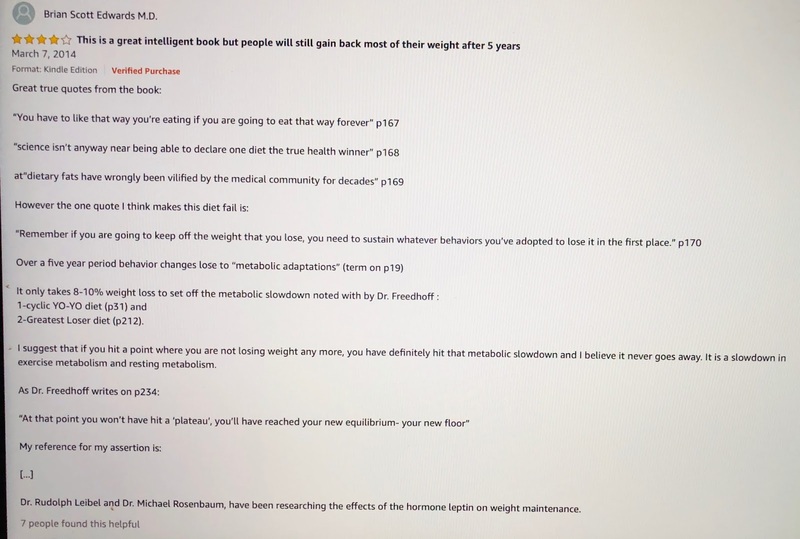 I am a specialist in Obesity, Lipidology and Internal Medicine I have written two books recently that reflect a sea change or paradigm shift in treating cardiovascular disease and obesity. First National Lipid Association meeting 10-19-06. Passed NLA Boards 9-27-08. Wrote The Tubby Theory from Topeka 12-08. Became a Fellow of NLA 5-1-09 Heard Dariush Mozaffarian speak about saturated fats at NLA meeting in Wash DC Summer 2010. 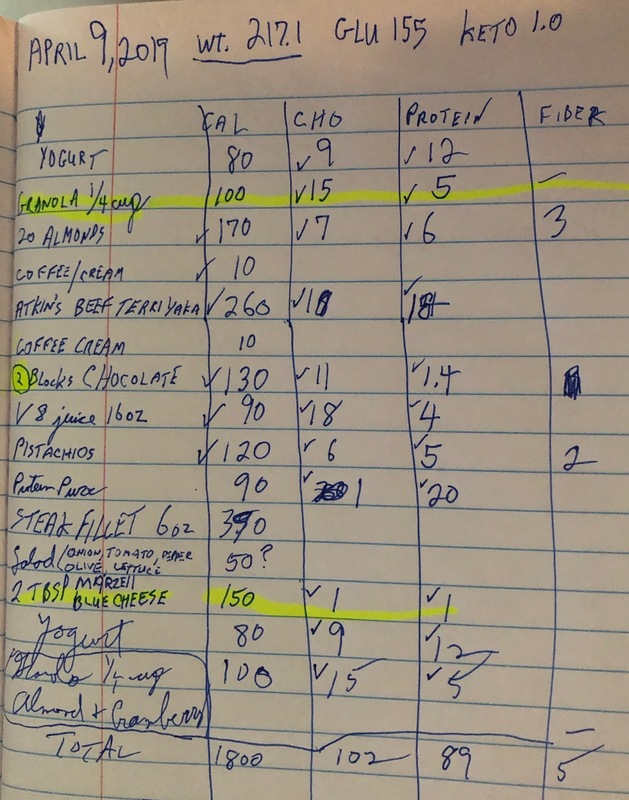 Read Gary Taubes Why We Get Fat and What to Do About it, 1-5-11. Started Atkins diet 1-6-11. Published The Tubby Traveler from Topeka April 2012. Took the American Board of Obesity Medicine Exam on 12-10-15. 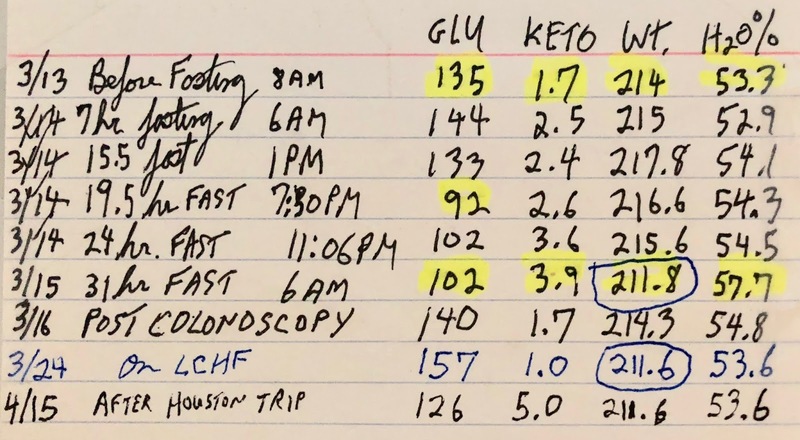 If in 2006 President Bush's doctors did take him off statin when they knew he had a positive CAC of 4 (which I believe elevates him from low CV risk to Intermediate CV risk), how do they know when to put him back on a statin and to what goal? The answer is obvious, they use stress testing. Apparently the stress test last year was normal so his Doctors missed the opportunity to get President Bush back on statins. A follow-up CAC without contrast might have been enough. CAC only costs $100 while a Angio CAC is much more expensive and more radiation. But first a word about particle sizes. The major driving force with respect to apoB particles entering the arterial intima is 1-particle number (especially LDL-P) and of course 2-endothelial function. Kudos for promoting LDL-P, CAC and CIMT. Jimmie has not yet had a CIMT. He also did not publish his HDL-P of 30.7. As Jimmies writes, it is about the particles not the cholesterol. 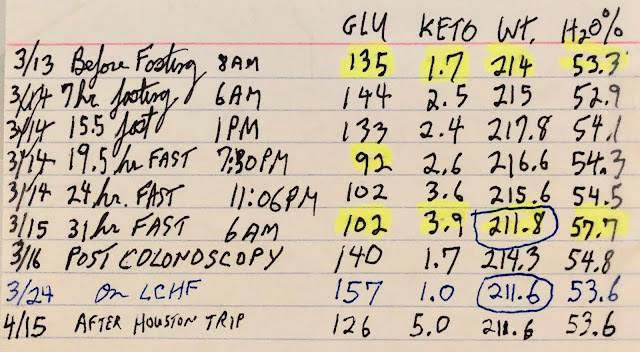 His high HDL-C is meaningless as he has a small amount of HDL particles loaded with cholesterol. This has no bearing on the functionality of his HDL-P.